BANGI, 7 June 2012 –Chairman of The National University of Malaysia (UKM) Board of Directors, Prof Emeritus Dato’ Dr M. Zawawi bin Ismail was presented a Life-Time Achievement Award by the Kelantan Darul Naim Undergraduates Association of UKM (PERDANA) last night. It was given to him as a Kelantanese and in recognition of his achievements. It was presented by UKM Vice-Chancellor, Prof Tan Sri Dato’ Wira Dr Sharifah Hapsah Syed Hasan Shahabudin at the PERDANA awards night at the Dewan Canselor Tun Abdul Razak (DECTAR) at the campus here. Prof Emeritus Zawawi had his secondary education at the Sultan Ismail College, Kota Bharu and Victoria Institution, Kuala Lumpur. He gained both his bachelor and doctorate in Electrical and Electronic Engineering from the University of Leeds, England. He is a Fellow of the Academy of Sciences Malaysia and an Honorary Fellow of The Institute of Physics Malaysia. Before taking up his post at UKM in April, Prof Emeritus Zawawi was Chairman of the Board of Directors of Universiti Sains Malaysia (USM). Prof Emeritus Zawawi is not new to UKM as he had served as Dean of the Faculty of Engineering in 1989 and Deputy Vice-Chancellor (Development) in 1991. 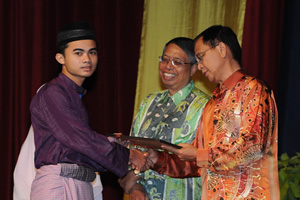 PERDANA also presented awards of excellence to 34 of its members drawn from every faculty of UKM. It has more than 1,000 members at both the Bangi and the Kuala Lumpur campuses of the university. PERDANA advisor, Prof Emeritus Dato’ Dr Abdul Latif Mohamed was present.